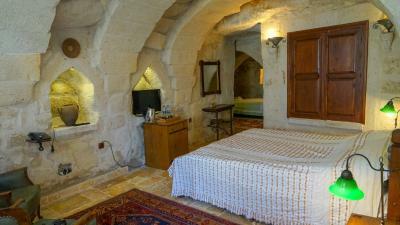 Lock in a great price for Sultan Cave Suites – rated 8.8 by recent guests! 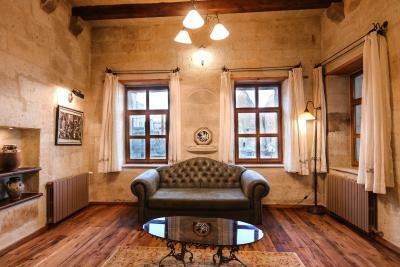 Great location and relatively cozy rooms. Great instagram friendly terrace. The staff members were so friendly, helpful and attentive. They even offered to give us a lift over to another hotel upon us checking-out. They helped us book our tour, and spa appointment. During sunrise, they helped us take professional photos on the terrace! 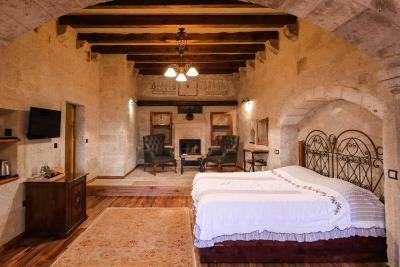 Our cave suite was amazing. It was HUGE, with a sitting area and large sleeping area. 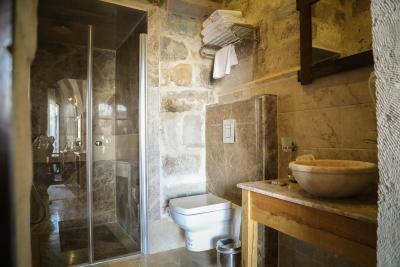 The bathroom was very nice and exceeded my expectations for a cave bathroom. 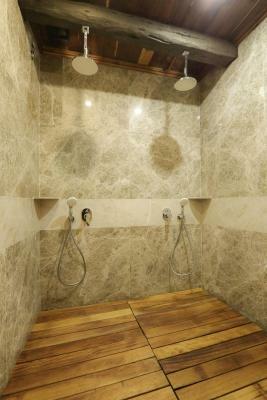 I was worried it would be cold in there, but it was actually very warm, like it had heated floor tiles. The breakfast buffet was also amazing - coffee, eggs made to order, a wide selection of cheeses and pastries were all included. Amazing stay! We booked the green tour and Butterfly balloon ride via the hotel. Lovely experience! The staff was so friendly. the food at the restaurant was very delicious. the view from the terrace was amazing, especially at night. The hotel is in good location, their terrace has the best view for hot air balloon viewing. I traveled with my husband and 3 children (6, 7 and 12 years old). We have an amazing time. The owners and the staff were just amazing and made our stay very pleasant. The location was spectacular. We had an unbelievable view to the hot air balloons in the morning. We would highly recommend this place to anyone. 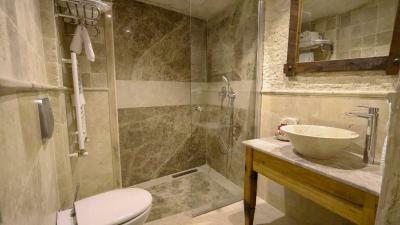 Friendly staff, nice room and near main restaurants in town. BREAKFAST, venue, ambience, sunrise, everything was amazing. The hotel is very unique. 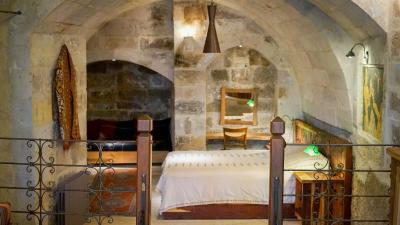 Its like a castle cave and it also clean and comfortable. 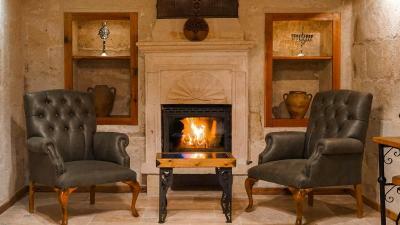 The room is very nice and we have our own living room with fireplace. The food is also very nice and the most important quality is the staff, they were so friendly, helpful and very professional at the same time. 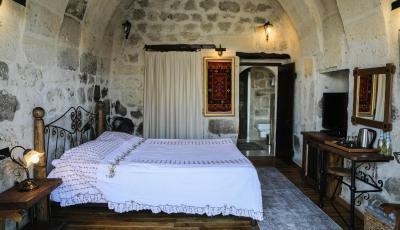 Perched atop Aydinli Hill, this unique hotel offers cave rooms furnished with antiques from throughout Turkey. 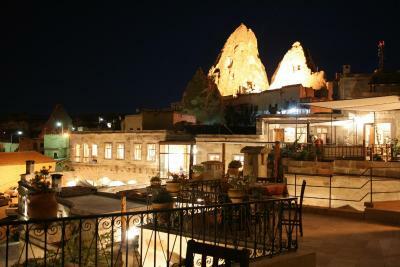 It features far-reaching views out over Goreme from its panoramic terrace. 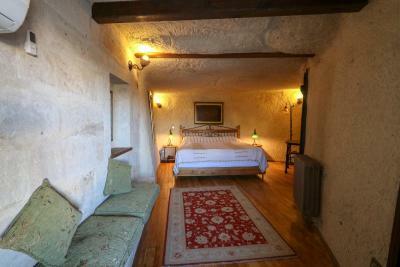 Most guest rooms at Sultan Cave Suites are set into the hill, providing cool temperatures and tranquility. The majority has a private patio or balcony, and all have a sitting area and modern private bathrooms. 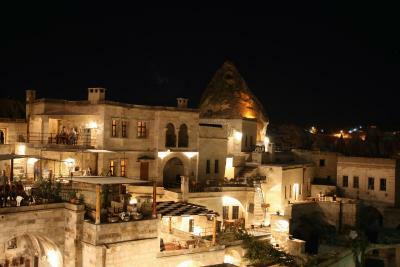 Cave Suites Sultan features a stylish restaurant serving regional specialties from Cappadocia. After dinner guests can relax with a drink on the terrace and watch the sun set over the village. The hotel arranges local excursions including hot air balloon flights and hiking tours. The picturesque landscapes of Goreme Tarihi Park are less than one mile away. Free shuttle from the bus station and airport transportation for a small fee are available upon request. Free Wi-Fi is available in public areas. 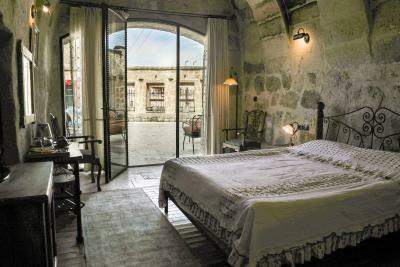 When would you like to stay at Sultan Cave Suites? 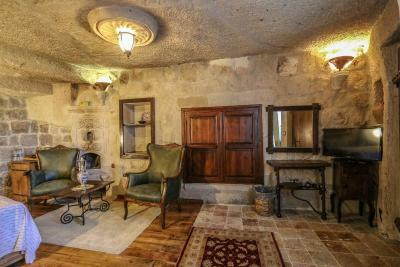 Spacious cave suite with a sitting area. 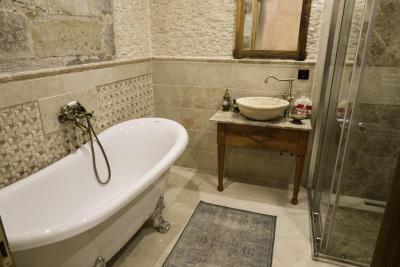 Large suite with a spa bathtub or bathtub, balcony and sitting area. One-bedroom suite with a separate living room. 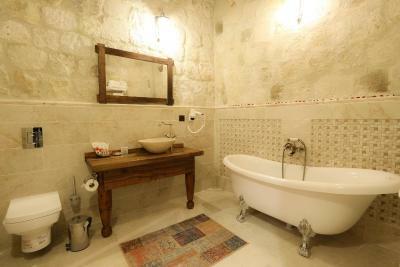 House Rules Sultan Cave Suites takes special requests – add in the next step! Cash Sultan Cave Suites accepts these cards and reserves the right to temporarily hold an amount prior to arrival. Sultan Cave Suites accepts these cards and reserves the right to temporarily hold an amount prior to arrival. 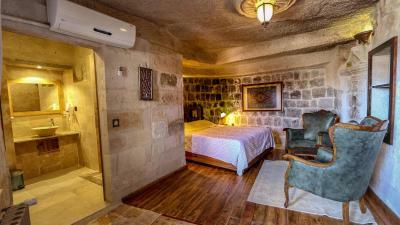 The only thing is that they should ask or at least inform beforehand about room swaps to sister company “Kelebek special cave hotel” which is just next door. Being one of the best vantage points to view the Hot Air Balloon is why majority of the people come here (myself included). 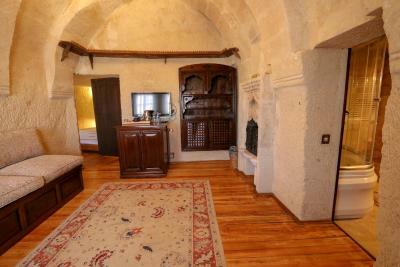 But soon you realise that this place offers much more than that, the cave suites are fantastic and so spacious!! The staff is so friendly and helpful that you literally don’t have to worry about anything. There’s an amazing restaurant within the property which has the best house wine in my opinion and the view of the sunset and basically whole of Göreme offers much more value than the price of the suite! Definitely recommend a stay here!! Great location . Helpful staff . I advise you not to book ballon flights through them. I’ve reserved a ride for two almost half a year in advance only to find out that they forgot to book it. Props to the staff that managed to resolve it by 11pm the day before the flight but I was charged a hundred euro more than the original price. The location is a bit far from the centre of town. There's a path you can take and it would take about 20 minutes to walk to town. But the view from here of the balloons in the morning is spectacular. A little dusty probably we were not used to a cave hotel. 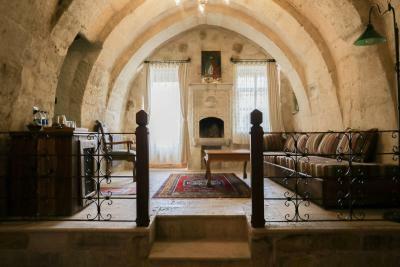 Staff onsite is very helpful to recommend tours of Cappadocia but would appreciate if payment instructions were specific. Staff mentioned that tours can be made via credit card but turn out that all tours accept cash only. Definitely instagram worthy. 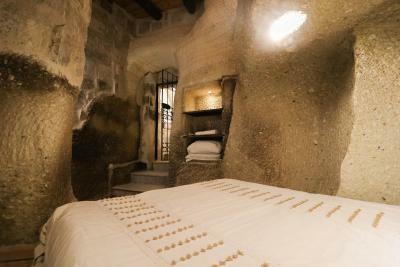 Very nice layout and experience to stay in a cave. Some of the rooms are disconnected from main hotel. You have to walk on road for 100 meter to reach breakfast and reception area. Further, completed range of room isn't available on booking.com- you may get confused between what you see online and what you get. Suggest to conduct a thourough research before selecting your room. The location is amazing and offer great shots for Instagram. The staff were very nice and friendly. The breakfast is also very good. All the staff was so nice and made our whole stay. Also big plus for the breakfast buffet that was amazing every morning. Can’t recommend this hotel enough!